The Liturgy Committee last met on Thursday 7 August. There have been some suggestions over a period of time about making an effort to specifically invite and encourage families to participate in Sunday Mass in particular ways on a regular basis. Paola Yevenes, our Sacramental Coordinator (and member of the Liturgy Committee) has been working on a proposal that the committee will work on with Paola and the school. We anticipate putting the ideas into place from the beginning of next year. The committee evaluated the liturgical celebration of the parish feast day. It was pleasing to see the positive response to the welcoming of new parishioners at the 10:30 am Mass on the day, as well as the participation of students from our primary school and our Lay Carmelite community. We thank everyone who was involved in the celebrations. Finally, our continuing evaluation and review of our celebration of Sunday Mass focused this time on the Liturgy of the Word. We considered how we can help focus the attention of the assembly on the proclamation of the Scriptures, and support both new and existing Ministers of the Word in proclaiming the Word effectively. This discussion will continue at our next meeting. The introduction of the new translation of the Roman Missal is not just a chance to learn new words, but will hopefully be an opportunity to come to a deeper understanding of the Mass. The Profession of Faith is one way we respond to what we have heard in the scripture readings during Mass. The translation of the Nicene-Constantinople Creed has been revised, as has the translation of the Apostles’ Creed. One of the noticeable elements of the new translation of the Nicene-Constantinople Creed is that the existing text “We believe…” is replaced with “I believe…” Although it is a seemingly small change, it will no doubt take some getting used to. Some people will wonder why this change occurred, and may agree or disagree with it. As we’ve already discussed, the new translation of the Missal is characterised by a closer, word-for-word translation of the Latin text into English. 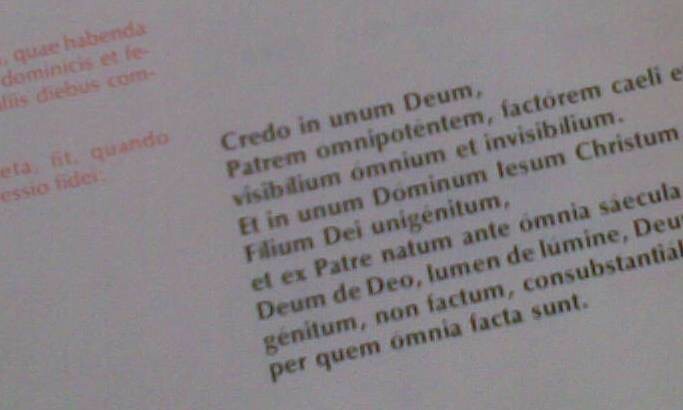 The Latin word Credo, which begins the creed, translates into English as “I believe”. There is more to consider here, however, than simply translation. As we discussed last week, the creed did not become a commonly used prayer during the Mass for about 600 years after it was developed. It was originally intended as a personal or individual profession of faith. Parents are asked to renew their baptismal promises when they want their child to be baptised. Confirmation candidates are asked to profess their faith, as are adults when they approach Christian Initiation. Each of us is invited to renew our baptismal promises at Easter time. In each case, we respond not with “We do”, but “I do”, for each of us is called to give personal testimony and witness to our faith. While we have been used to saying “We believe…” each Sunday, the upcoming change back to “I believe…” does not try to deny the communal nature of the Eucharistic celebration. The use of the words “I believe…” will hopefully challenge each of us to personally consider our subscription to the faith of the Church and its consequences. Our communal praying of the creed will hopefully serve as a sign to each of us that we stand in solidarity with everybody who belongs to this community of faith. In the Liturgy of the Word, God speaks to us. Through the proclamation of the scriptures at Mass, Christ is made present amongst us. After the Second Vatican Council, one of the obvious reforms to the Mass was the increased use of scripture. After we listen to God’s word in the readings and have it broken open for us in the homily, we respond by professing our faith and praying for the needs of the Church and the world. For most of the Liturgy of the Word, there is very little that will be affected by the new translation of the Missal. The one part that will be obviously different, however, is the Profession of Faith. The Nicene-Constantinople Creed is retained, although the words will change. This creed takes its name from the Church councils where it was formulated and ratified. At the time, it was never intended to serve as a liturgical text. The creed, which came out of the First Councils of Nicaea and Constantinople in the fourth century, was a direct response to the divisions being caused in the Church by the theories of Arius, who argued that Christ was created by God, rather than being God. After declaring that God the Father and the Son are consubstantial (“of the same substance”) at Nicaea in 325 AD, the credal statements on the Holy Spirit, the Church, baptism, resurrection of the dead and everlasting life were developed at the Council of Constantinople in 381 AD. This then completed the elements of the creed as we know it today. It was not until the end of the millennium that the creed started to be used as a prayer during the Mass itself. Eventually in 1014 it was adopted by Pope Benedict VIII. It now forms part of our response to God’s word on Sundays and solemnities.